In this booklet, we explore how to build a trust culture, develop win/win relationships, and apply feedback. We also examine critical steps to building teamwork and team spirit that results in improved communication, creativity and innovation. Finally, we look into different ways to cope with the normal chaos that comes with this level of change. In particular, we explore issues related to paradigm paralysis, and dealing with and overcoming resistance. "There is an old Indian saying: Churuga chollal and vilanga vaital. It reads: Be clear, be brief. That is Geery's talent. Why does this old Indian saying still hold true? We need time to reflect, and we need energy to reflect. When a message is wordy, the energy is spent in reading and little energy is available for reflecting. The sum total of our energy is fixed and how we apportion it is important. Where I find Geery's writing classic is that he commends energy for reflecting and energy for acting. I 'envy' those who have the benefit of personally interacting with him." Author, consultant, coach and business educator for over four decades in India. He is the author of over 20 titles, including Practice of Excellence in Life and at Work and Spiritual Culture in the Corporate Drama. "In today's world, change is not only the constant, but extremely fast paced. Because of this reality, leaders at all levels of an organization need to understand how to influence their organization's culture. As Geery points out in Developing a New Organizational Culture, "The culture should become the strategy for a company's long term success." This booklet provides a thought provoking guide to transforming the way a company works. It is written with the team in mind and I found it to be an excellent tool for building a common language within our team. It is easy to talk about change... it is harder to turn change into results. I would recommend this booklet for anyone who wants to build a team capable of consistently uncommon results." "I have worked with Geery Howe and Morning Star Associates for over fifteen years. 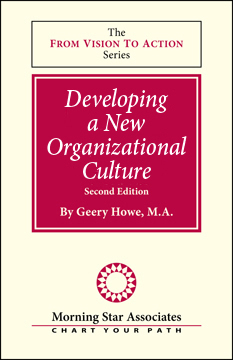 Geery, in Developing A New Organizational Culture, has captured the issues of a very difficult, lengthy process in a succinct yet comprehensive book. It is one of those books that should become a part of every leader's library. One that will be read repeatedly as leaders continually fine tune their organizations." It was a beautiful October morning when she called me. The sky was a clear Colorado blue, and the trees were a blaze of reds, golds, and brilliant yellows. A crisp texture in the air hinted of an impending frost. She spoke with great enthusiasm and eagerness. "I'm challenged to lead a significant increase in gross revenues this coming year," she began. "It is very doable but will require a lot of focus." She reported to me that during the past year they had achieved $1.7 million in sales and that the goal for the coming year was to stretch this to $2.5 - $2.6 million. "We need to raise the bar at this point," she pointed out. We need to close the gap between what we are doing now and our optimal performance. And I know exactly what we need to do to get to the next level -- a total productivity increase within this organization over the next 90 days." She then proceeded to ask for my assistance in building a timeline with goals and objectives, a report on how to address all financial barriers, a new PR program, and a market-niche analysis done with all major stakeholders. I suggested we meet for breakfast to discuss her challenge and we set a date. Following this phone conversation, she sent me a huge packet of material with many charts and reports for my review. She sat quietly for a moment and replied, "I'm not sure I know." As you can see, the challenge for many executives is to figure out which bar they are trying to raise. And while I admire the goal of striving for optimal performance, the key is to realize that optimal performance is the result of having an optimal organizational culture. First: All involved are building something, i.e., taking a vision and turning it into reality. They are clear about this vision and work very closely together to make sure they are in alignment with it at all times. Second: The organization has a core philosophy about how things are done and what is most important. This mission, with its core values, permeates all they are do- ing on a daily basis, and, at the strategic level, it is their compass. Third: They have an internal drive for progress. They have what I call the "want-to" factor which is translated into a "can-do" attitude. They determine to get better at what they are doing and are constantly seeking out ways to improve and innovate. Fourth: They have specific systems that preserve their core philosophy and stimulate progress. These systems are critical to the success of their mission, and they are monitored closely and used faithfully, resulting in consistent results. To continue with my story: Over breakfast that morning, I explained to her that raising the bar for optimal performance and striving to hit a $2.5 - $2.6 million-dollar goal was admirable -- but that the real challenge was to transform her current organizational culture into one where this level of growth and customer service would become the norm rather than a singular event. As we continued to explore this perspective together, she came to realize that, in the beginning, leaders must prepare the organization for change and create clarity about change. Then, they need to build a foundation of trust and improve teamwork. It is the fusion of these elements that will develop a new organizational culture. As an Iowa farmer taught me years ago, "What you feed, grows." The same goes for an organization. The key is to grow specific core elements internally, so that a cultural transformation is propagated, thereby bearing the fruits of a long-lasting and ever-unfolding success. In this particular booklet, Developing a New Organizational Culture, we will explore how to prepare for cultural change, build a foundation of trust, develop win/win relationships, and apply feedback. We also will examine critical steps to building teamwork that results in improved communication, creativity, and innovation. Finally, we will delve into different ways to cope with the changes that come with this level of work. In particular, we will explore issues related to paradigm paralysis, and dealing with and overcoming resistance. In short, we will raise the bar together, and continue transforming vision into action.